PESHAWAR: Khyber Pakhtunkhwa (KP) government is fully determined to complete the Bus Rapid Transit (BRT) in Peshawar despite delay and sacking of TransPeshawar CEO Altaf Akbar Zaidi, CM Pervez Khattak assured on Sunday. Talking to reporters here Sunday, Chief Minister KP Pervez Khattak defended the decision of sacking the CEO responsible for the project over failing to meet the deadline. He said the concerned official “ignored repeated reminders by the provincial authorities”. Although the delay had pushed the completion date for two months, it would still be a record to complete such a mega project in eight months, said the CM. “The CEO deliberately delayed the procurement of buses,” he added. 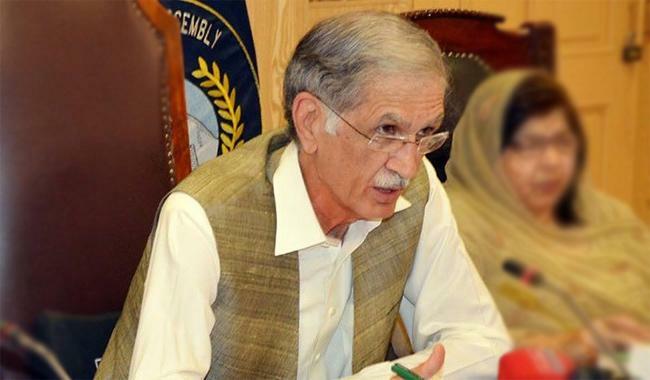 Earlier, Khattak dismissed CEO Zaidi due to his “poor performance”, which reportedly caused a delay in the inauguration of Bus Rapid Transit (BRT) system in the city. After the termination of TransPeshawar CEO over refusal to procure buses despite KP government’s insistence, the top management of the company, including Board of Directors Chairman Javed Iqbal, Chief Finance Officer Safdar Awan and General Manager Operations and Market Development Mohammad Imran Khan, have also resigned in an ostensible protest. According to reports, the KP government took the decision to remove Zaidi as CEO after he refused to procure a bus fleet worth Rs5.5 billion at a time when the BRT infrastructure and corridor were incomplete. The reports said that the CEO was asked to transport the buses by road from China. Altaf, however, refused to comply, saying that it would increase the cost of each bus by at least $30,000, besides affecting the warranty of the vehicles. The CEO has also been reported to have informed the government that there was no depot for the hundreds of buses and the infrastructure was also not yet ready for the operation of the vehicles. Altaf was specially called from Canada to Peshawar for the BRT project since he had the experience of managing a similar scheme abroad. KP CM Spokesperson Shaukat Yousafzai said the CEO was removed since he did not perform up to the mark and kept changing dates for completion of BRT project. He kept on “lying” and eventually did not manage to inaugurate the project on May 1, Shaukat added. However, removal of the officer from service would not affect the BRT project, Shaukat said, claiming that the government stood by its promise of inaugurating the BRT system before elections. In a letter later in the day, he said there was great pressure exerted on him for an advance purchase of buses in April; however, lack of parking facilities and depot for these buses matter of concern as the BRT track will take some time to complete which goes in right direction as per the rules of Asian Development Bank. The CEO further said that TransPeshawar has followed the ADB procurement guideline and did not cause any delay to the project. “If the buses and ITS equipment were procured before April 20, the government would already have been liable to pay a substantial amount of Money to store and secure the buses and ITS equipment,” he clarified.